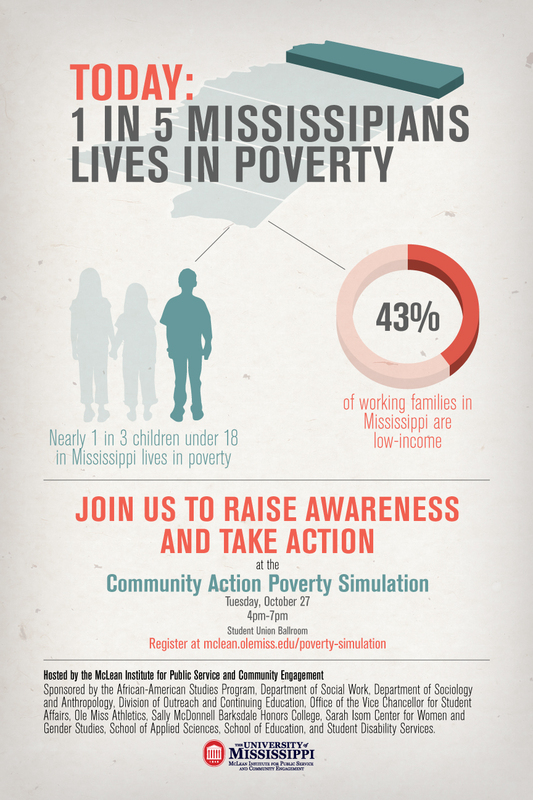 The School of Applied Sciences is proud to be one of sponsors for the upcoming Community Action Poverty Simulation on October 27th at the Student Union Ballroom on the campus of University of Mississippi. The McLean Institute for Public Service and Community Engagement advances transformative service throughout the University and fights poverty through education in Mississippi. Their community engagement work seeks to impact low-income families in our state because more than 1 in 5 Mississippians live in poverty, including nearly 1 in 3 children under the age of 18. To help raise awareness and inspire UM students to take action, the McLean Institute will host the first Community Action Poverty Simulation on Tuesday, October 27, 2015, from 4-7 pm in the Student Union Ballroom. 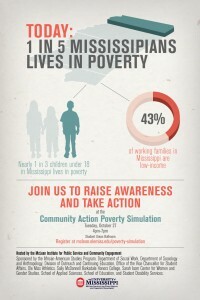 The poverty simulation was developed by the Missouri Association for Community Action and has been used at the University of Mississippi Medical Center as a successful learning tool to help people understand the realities of poverty. During the simulation, participants make decisions mirroring the day-to-day realities of low-income households, disabled individuals receiving government assistance, and senior citizens on Social Security. Participants must navigate the stresses of providing for basic necessities and shelter on a limited budget during the course of four 15-minute “weeks.” They also interact with volunteers portraying human service agents, grocers, pawnbrokers, bill collectors, job interviewers, police officers, and others in the community.